In a very pure sense you build the accelerator you need when you know what the question is. As an astronomer I'm lucky to work in a subject where there is already public interest, and where it's not too difficult to convey the key ideas and new discoveries in a non-technical and accessible way. It's far harder to make particle physics accessible and interesting. Brian Cox is one of the few scientists who succeed in doing this, and I much admire him for it. It's fortunate that he's been willing to devote so much time and effort to 'outreach'—and especially to seize the opportunity to publicise the LHC launch so effectively. Scientists—not just particle physicists—should be grateful to him for raising the profile of 'blue skies' research so engagingly and effective. —Martin Rees, President, The Royal Society; Professor of Cosmology & Astrophysics; Master, Trinity College, University of Cambridge; Author, Our Final Century: The 50/50 Threat to Humanity's Survival. 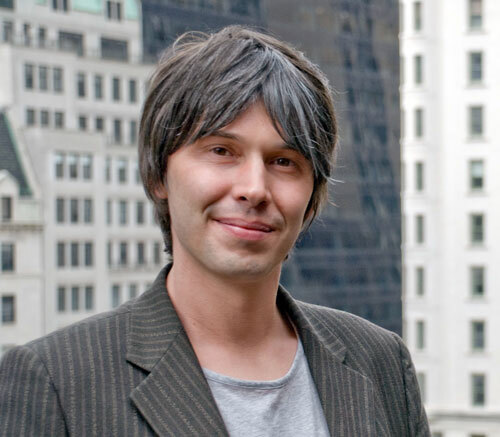 BRIAN COX is a Royal Society University Research Fellow based in the Particle Physics group at the University of Manchester, where he holds a chair in Particle Physics. He works on the ATLAS experiment at CERN in Geneva. A former rock star, he has become a well-known public communicator of science to the public through highly-regarded television and radio presentations on the BBC and other networks. [BRIAN COX:] There are two sets of questions I am asking myself. One set for the scientific questions, the research that I do, but the other set, which is beginning to bother me more and more is why as a civilization we spend so little time and so little money and so little effort learning about the way the universe works. For example, the average government investment in science in the Western world is about 0.4 percent of GDP. It depends which way you look at it—I know in Britain the science budget about 3.5 billion pounds a year—so you can work that out. It's a pitifully small amount, and what's begun to bother me is the question, is that optimal in any way? Has it been optimized? Has anyone even stopped to think what would happen if you doubled it or tripled it? And about a year ago that was a controversial thing to say because 3.5 billion pounds or 5 billion pounds—$10 billion—sounded like a lot of money. Now it doesn't sound like a lot of money at all. It's fractions of a percent of the bailout packages. I know in the US that it seems that there's going to be a large input, increase in science spending. I want to know whether it's optimized. I strongly suspect it isn't. I know when I ask people in the British government what would happen if you doubled the science spent, they don't know. They don't know what the impact would be on GDP, on our quality of life, on the rate of discovery. And with that actually goes an interesting question, which is, if you increase the amount of, let's say taxpayers' money into science, then what's the responsibility of the sciences back to the taxpayers again? How should government direct scientific inquiry given that they spend taxpayers' money on it? Should you follow government priorities? In Britain, and I'm sure it's the same as the US, it's energy, security, climate change, aging population. But when government directs scientific research, it's my opinion, and this is not necessarily true, that it rarely works. You look at paradigm shifts, the big scientific discoveries, and you can name them all, you have penicillin or the transistor or nuclear power or solar cells, anything you want, I struggle to find one that came from direct government scientific research. They're chance discoveries, and it's not surprising to me. It’s actually obvious why that is. Here's the known and here's the unknown. The unknowns are here, the knowns there. If you populate this border with lots of people who are free and allow them the freedom to just investigate, it seems obvious to me that they're going to make more inroads into the unknown more quickly. The more you constrain them and the less freedom you give them because you're concerned about the funding and you're trying to direct what they do into precise areas, then the less inroads you're going to make. What's exercised in me is how do you convince government—because I'm convinced it's a good idea—to invest properly, not at 0.4 percent or 0.5 percent in GDP, but let's say two percent in GDP, which is still pitifully small, in science without constraining the freedom of those scientists. And that's so you will get the next wave of paradigm shifts that will make the world better. That exercises me. Scientifically I work at the LHC in Geneva, the Large Hadron Collider, whose job it is to take the next step in what I think is the main road of physics, the main line of physics. The LHC's job is to understand the forces of nature and to understand the building blocks of the universe, the smallest building blocks of matter. In that respect you can draw a line from Newton, the first modern theory of the force of gravity, and you can go on to Maxwell, building on the work of Faraday, so with the forces of electricity and magnetism unified together you get the theory of electromagnetic waves. You get the speed of light being a constant in that theory. That leads to Einstein, E=MC squared. You get the theory of the weak and the strong nuclear forces. The LHC is the next experimental step on that road—we've been stuck for 30-40 years since a big new idea emerged on that road. We've been stuck at a particular point, which is the origin of mass in the universe. This is what the Higgs Boson is supposed to fix. But to many people it looks like classical physicists just looking for another particle, they spend $10 billion and we look for another particle. It's not that at all. The question of mass in the universe is dictated by the place where we've become stuck. It’s the door that is closed. I can go into some depth and detail about why that is, but the point is that we know exactly where to look for the origin of mass. We know what energy to look at and what energy of collisions we need. If you want to think of it this way, we know how far to go back in time to the Big Bang to look. Now, the LHC has plenty of energy to do that, so it will discover the origin of mass in the universe, but that's not an end in itself. That's a door, the door on the main road of physics, which we'll open when we discover it. And it should take three to four years, if the LHC performs as we like. As you may know, we had some issues, which blew a little bit of it up after commissioning it. Without the schedule of the moment, as I speak in February of 2009, is that all the refurbished magnets—we damaged about 50 of them—will be back in the LHC in the end of March. The LHC will be commissioned in September and begin to take physics results in October, and run for a year, which is unusual for CERN, which really takes days for over the winter, but we're going to run for a year. So it's pretty much caught up to where we should have been anyway by autumn 2010. It's an exciting time. It's actually the first time certainly in my career, and probably for 20, even 30, years that you could guarantee that you have a particle accelerator that has enough energy to discover something profound, which in this case is the origin of mass in the universe—maybe Higgs, maybe something else. My most cited paper is called "WW scattering in the absence of a light Higgs," so those are my cards on the table. If you decide not to allow, or you request that politicians do not direct the direction of scientific research, then the question arises, well, who does it? Somebody has to allocate the billions of dollars of public money that are spent on scientific research every year. Scientists are good and bad at doing this. Scientists are very bad when pressure is applied to them, because scientists are clever, and scientists are good at playing systems. If you put a system in place then the scientists will go and get the money, and there's a huge danger of scientists trying to second guess government, and you get into a vicious circle. Let's say governments want particle physicists to have an eye on the big questions of the day—for instance, energy security. There's some overlap between particularly fusion research, big science projects that require big magnets that are similar in many ways to the magnets we use at the LHC. What you can see is that a scientist in a university whose salary—particularly in the US, but also in the UK— and professional standing is based on the amount of research income they get, will build research projects they think governments, or at least the funding agencies, will respond to. The direction can often be accidental. This is a snowball effect, and I've seen it in effect in the UK. Obviously a politician such as a science minister will say that the government has priorities and doesn't really think about the impact that will have further down the food chain. But for some reason people listen to politicians really carefully and they pick out the little nuances as they see them and then start modifying their behavior. Before you know it you have an intensely directed, narrowing, science program, which nobody really intended to generate. What you need actually at the top of science are people who are not in awe or overwhelmed by the political process and also who don't enjoy it, actually, because it's really quite enjoyable to start mixing with the powerful and trying to understand... I've seen it. You can get it into a mind set where you think, I know what these guys in Washington or London are thinking. And you start maneuvering. And you ruin the science program. You need people who believe that scientific investigation is of most benefit to society when it's free and who don't believe that politicians are the people who can maximize the benefit to society through the direction of science funding. There are 10,000 physicists and engineers at CERN, and many of them are not there permanently. The population in Geneva fluctuates. There are 85 countries around the world, and physicists from all of those institutes collaborate either on the data or in building the hardware. It is a wonderful place, because its commitment to blue skies research research, is absolute, and there can be no better symbol of that pure curiosity-driven research than the Large Hadron Collider. It has no use in terms of commerce. It's value is in furthering our understanding of the universe. If you want to defend the Large Hadron Collider, then the best defense is that it's never been a bad idea to understand the way the universe works. Right? History tells us that. CERN itself is very free, and its constitution is free. It came out of the Second World War. It was an international institution built to participate in the cultural regeneration of Europe. I believe first conference that was mentioned might have been 1949 in Lausanne, but it was officially founded in 1954, officially. The constitution says blue skies research for the peaceful pursuit of knowledge I think is in the constitution of CERN. It's a wonderful place. But then at the national level it changes a little bit, because the particle physics' budgets become subject to the political kind of manueverings of the day in particular countries. Again, CERN has a huge advantage because it's protected by international treaty certainly amongst the 20 European member states. There is kind of a story, it may be apocryphal, but in the '80s Margaret Thatcher's government in Britain was very aggressively looking at all government spending and looked at pulling out of CERN. But the UK contribution to CERN today is 80 million pounds a year, and that's an international treaty, and it is far too much hassle to pull out of an international treaty for a government, because the cost/benefit ratio of causing the trouble just seems to be too much. That's the story that you hear. It's actually a very small budget if you think about it. It's about the budget of a medium-sized Western university. It's less than a billion dollars a year in total. Once you arrive at CERN and you're part of one of the big experimental collaborations—there are four of them, ATLAS, CMS, LHCB and ALICE—around the LHC. The work that you do within that is divided into two bits. All universities play some role in maintaining the hardware. There is a serious bit of science and engineering to do, so the bits of hardware, the bits of the receptors are built in the universities around the world, and that's your responsibility. You have an organization to do that, and that's the kind of serious day-to-day bit. The other bit is when the data comes, which is what everybody is in it for. Then you have complete freedom to do what you want with that data; anybody from the collaboration can look for anything. Actually one of the great challenges for people who manage the top of these collaborations is to try and make sure that not everybody goes and looks for the Higgs particle, for example, because there's a ton of physics to do. You can only use coercion to do that. We've never collided particles together at these energies before, so it's an interesting management challenge because you want to cover the whole of the physics and the whole of the physics you can do. It does get covered because there are different characters in experimental physicists. Some of them like to work on the big questions, which by definition require a big team. If you're looking for the Higgs, there's a huge working group at ATLAS—let's say there are hundreds of physicists from 10, 20 institutions all working together to do it. Or you can go into a little corner, a kind of more esoteric branch of particle physics, where you might be working on your own with a couple of grad students at your university. Fortunately, because there are lots of different characters, it seems to balance out quite nicely, and there are enough people to do everything. I personally like to drift off into slightly more esoteric corners. I like to work a little bit on my own, or in a small group. I do two things. One is I lead an upgrade project—a hardware update project—and the aim is to put these little detectors half a kilometer away from the point where the protons collide at the LHC. This is to take advantage of an interesting process called central exclusive production. Basically the protons come in and they can glance off of each other and they can stay intact. You get: two protons in, two protons out, lose a bit of energy. All of the energy they lose can go into the production of a single object, which you'll see in the main detector. So that could be a Higgs particle. You get PP, it goes to PP Higgs, because these protons lose a bit of energy when they go around the corner in the LHC, so we go through the magnets. They get bent a little bit more because they go in a little bit slower into the magnetic field. They get bent out of the beam. And at half a kilometer away, if you can get little detectors in to about five millimeters from the LHC beam, which has the energy of an aircraft carrier going at 30 miles an hour, by the way, so you have to be careful, you can grab these. You can detect them. And when you think about it, if you can just detect both of them then you can measure exactly how much energy got lost, because you know where they are and how far they came out of the beam. So you can measure the mass of the thing beautifully accurately to really high precision. It might have been a neutral thing. Iit turns out that in this process, if you see a Higgs particle you immediately know what its properties are. There are other properties as well that you can infer from this process. It's one of the only ways anyone has been able to think of LHC for measuring the properties of the Higgs. You can detect it and you can see what its mass is and you can discover it, but you've also got to measure what it is to show that it is a Higgs. Or it might be some other kind of thing. This was a process that really myself and a few colleagues in theoretical physics worked on about eight years ago. When we built the LHC and designed it, we didn't know really about this process. You asked the question, could we add them in, these little detectors, as an addition, and use this process? That's going quite well, actually, on two of the big experiments —ATLAS and CMS. That's through the R&D phase and into the kind of final development phase. That’s my hardware thing and that was kind of my idea—I actually lead that on both collaborations. Then the more standard physics I'm very interested in—that's Higgs. I'm very interested in what happens if there isn't a Higgs. Because the great thing about the LHC is that it has enough energy to discover the mass generation mechanism, whatever it is. We know exactly at what energy our theory, the standard model, the particle physics, breaks down and doesn't work without a mass generation mechanism. It's 1.4 TeV in particle physics units, the LHC has 14 TeV. It has plenty of energy to go to that point and it breaks down in a very specific place, which is there are particles called W-particles, and they carry a force called the weak nuclear force. That is the force that allows protons to turn into neutrons in the sun. The sun works by taking four protons, four hydrogen nuclei, and making a helium nucleus, which is two protons and two neutrons. The sun has to turn protons into neutrons. And the W-particles, the weak force, does that. It's fundamental to the universe, but quite esoteric in that we don't notice it here on earth very much unless we look at the sun. So we do. We don't know we're noticing it. Those things, those W-particles, are very heavy. They're 80 times as heavy as a proton, so as heavy as a nucleus of gold, or something like copper, let's say, something like that. That is the piece of the standard model that really requires the Higgs. The matter particles are not too problematic with giving masses to them. We think that goes to the Higgs mechanism as well, but it doesn't matter as much. It really matters for the force-carrying particles. Having massive force-carrying particles is a nightmare for the mathematics and the beauty of the theory. It turns out that when you collide those things together, which you can do at LHC, you can have some protons going along, and they can emit W-particles and they can bounce off each other. It turns out that that's the most sensitive place to look for the origin of mass, indeed whether there's a Higgs there or not. It's the process that you want to look at. I've done a lot of work on looking at what happens if you make no assumptions and you look for WW bouncing off each other in the detectors at LHC and just measure it without prejudice, without any assumptions at all—make a measurement and look, because then you don't bias the results at all. It's an interesting process. Most models, even models that have extra dimensions in the universe, which can explain mass generation—whatever you want—you can see it in that process. I could give you a more technical answer for the connoisseurs if you want, but that's a beautiful process. If there's no Higgs then the mass generation mechanism over there—there's a good analogy because way back before we understood the strong force (that's before we know of things like quarks that build up protons and neutrons), there's a process called pion pion scattering. Pions are little particles like a proton with quarks in them, but we didn't know that. But we knew about the pions. And you can bounce them off each other. Actually, although historically this isn't the way it happened, you could have put a Higgs mechanism into that process. It’s in many ways identical to the WW scattering process, and so you could have put Higgs mechanism in. You could have done the calculations and you would have got the right answer pretty much for the way that they bounce off each other. But you would have been wrong. What actually controls that scattering process is the underlying substructure of the pions—the fact that they've got quarks in them—and you end up with the QCD, quantum chrome dynamics, the theory of the strong force. What actually happens is you bounce them together and make something called a rho particle, which then decays back into pions again. You have pi, pi, rho, pi, pi. The W-particles could be exactly the same as that. They could have substructure essentially as well. As they call technicolor, which is literally that. It could be that the history repeats itself, and what you do actually is you incorporate another layer of the onion, as it were. See, the Higgs is basically the assumption that there's no new physics until the point where gravity becomes important. If you have a Higgs-type theory it can survive all the way out to what we call the plank scale. So that's really an astatic choice in many ways. It doesn't have to, but it can. A Higgs-type mechanism is attractive to some physicists because it can survive. It can be the only thing you need. But of course there are many other theories. There are many other things you can discover, LHC, there are things called super symmetry, which doubles the number of particles, and that has five Higgs Bosons in the most basic version rather than one. There are lots of different Higgs mechanisms, so you can have Higgs-type mechanisms, and it is true to say there's indirect evidence for that. People don't just kind of like it because it sounds cool. There are measurements that have been made that are suggestive that that might be the right track. But you could have something completely different. That's the point. The problem of mass in physics, which sounds like a strange problem to have, occurred right at the birth of the standard model, which is the Newton's laws of particle physics. But there's a property of the standard model called a gate symmetry, which is a fancy word for a really simple idea. Basically let's take a particle like an electron. In quantum mechanics, an electron is described not as a point-like thing but by a field. You can really kind of almost think of a field with hills and valleys. If we put an electron in this room now, quantum mechanically it will fill the room. There will be an electron field which goes right to all the walls, and where it's got a big value, like a hill, then it's more likely to be, and where it's got a small value, like a valley, it's least likely to be. Of course if you put an electron in the middle of the room it will be very highly peaked where you would classically expect the particle to be, but it decays out like that. And what you find, and it was known back in the '30s in the origin of quantum mechanics is that these fields have an extra little bit of freedom in them—an extra little property—and it's called a phase. You can think of it literally like a clock hand, a little clock face. At every point you have a value for the field, and you have this little clock face. What was known right at the start is that you had a freedom in that you could put these clock hands any way you wanted, but you had to move them all at once. It’s called a global gauge in variance. The equations of physics don't change if you're allowed to move them all in parallel like that, right? But it was also asked, well, given that this seems like an arbitrary bit of freedom, what happens if you're allowed to move them all separately? That would be called a local in variance, and it was known that the equations changed. So you weren't given that freedom. But physicists persisted, Yang and Mills particularly, the first two physicists who tried this, say, well, can you fix the equations up, right? So we're allowed this freedom to move them all differently. It turns out that you can and magically what happens—so you start off with a theory of non-interacting electrons, there are two electrons there, and you don't have any force between them at all. Then you demand that you can move all of these things around like that in different places, and what you have to add in is precisely the mathematics of the interaction, the mathematics in this case of the electromagnetic force. The form, the electromagnetic force, the photon, the carrier of electromagnetic force, comes into the theory when you try and fix it up so you can move all these little clock hands around. The same turns out to be true in a more abstract higher dimensional clock hand thing for the weak force and the strong force, so three of the four forces of nature, excepting gravity, are what's called common, because of the demands of this gauge in variance, local gauge in variance. It’s very profound. It's a very attractive idea, because the forces of nature in this picture are essentially a consequence of demanding that you can move the little clock hands around everywhere in the quantum fields. Fantastic. That works, except it doesn't work if you introduce mass into the standard model. It breaks it again. So you're in a position where you have this beautiful thing, which gives you the form of the forces, but it only works if everything is massless, and particularly the little force-carrying particles that you introduced by this process, you get mass, then you encounter a particular problem. The W and the Zed particles, which carry the weak force, have a huge mass, experimentally. We discovered them in the '80s. They're there. We know how much they weigh (Inaudible) how much mass they have. So what you have to do is say, well, can we fix it again? It turns out you can. You can fix it again by introducing the Higgs mechanism. The Higgs mechanism works by filling the universe with another field called the Higgs field, so the picture is everywhere in this room, everywhere and inside our bodies and everything, this Higgs field permeates the universe. The way that particles get mass is they interact with this field, so as they move through the universe, things that have mass talk to the Higgs field, interact with the Higgs field. Literally you could imagine they're interacting with Higgs particles all over the place. Things that don't have a mass, like a photon, don't interact with the Higgs field, and travel through the universe at the speed of light. That's how the Higgs mechanism works. You can kind of say, in a hand-wavy fashion, that that dodges the problem, because in some sense things remain massless, and they get their mass by an interaction with a field. It's just like pulling something through maple syrup, in a way. If you get a little light thing and pull it through maple syrup, then it feels heavier because there's resistance. It’s kind of like that. And magically that allows the gauge and variance stuff to work, and you can almost see why, because in some sense the things don't have mass. You didn't put it in by hand; you generated it. That's why it's light; because it protects your beautiful mathematics again and allows this whole structure to work. It’s an integral part of the standard model of particle physics, the Higgs, now the so-called standard model Higgs. It's in there. If you take it out and try and predict things, particular things at the LHC, then it predicts nonsense, so whatever does the job you have to find. I'm absolutely an experimental physicist in every way. I believe that science is simple, basically. What you do is you look at the universe and you try to find out how it works and you address specific problems. Science is best when it works like that. There are two kinds of scientists. There are theorists who theorize, and they give you the kind of landscape of possibilities. They might miss what nature has chosen, but they tend not to, because there are lots of them working on different things. For example, there’s Lisa Randall, who thinks that many of the problems of particle physics could be solved by infusing extra dimensions into the universe. Or you have Leonard Susskind, who thinks that string theory may be the answer, or Brian Green, or you consider the more mainstream physicist, Frank Wilczek—these are the physicists who are involved intimately in developing the standard model, and they would look at Higgs light mechanisms, or super symmetry, which is probably the most mainstream extension to the standard model. It provides a candidate for dark matter in the universe, for example. Philosophically I feel it was wrong to offer an opinion. People can ask what's the most likely thing that will happen at the LHC, and I want to say that my view of science is that that would be almost an unscientific question. I would like to be the person who looks at nature without prejudice. That's impossible to do, though, because the most efficient way to find new physics at LHC is almost certainly to look at models, to look at what they predict and go and look for those signatures, because otherwise it's very difficult. If you just have a load of data and you have no idea what you're looking for at all, it will take you a very long time to find it in general. The Higgs, let's say, which is a big, mainstream, well-understood prediction, we know how the Higgs behaves in that theory, and it decays into particular particles. There are very well-known signatures and so the most efficient way to find it if it exists is to go and look for those signatures. It would be wrong to get too puritanical about the method of doing experimental science, but I find it very difficult to try and weigh the chances of the different theories being right or wrong. Some of it's sociological. There’s a tendency toward "guruification"—is that a word? —in physics. Some charismatic theorists—and there are many of them—who seem to have followers. That doesn't matter. It sounds terrible, but it doesn't matter, because actually science works by measuring the correctness or otherwise of ideas against nature, so it doesn't matter if you have gurus around, as long as they don't take everyone with them. If you took every grad student in the world and made them all work on super symmetry because you were the most charismatic —you were the Ghandi of particle physics—then it would be a bad thing, but that doesn't happen. Some of the criticism of string theory centers around that phenomenon. You hear some people getting upset because they think the brightest people have followed string theorists who in some sense would probably consider themselves to be gurus. You can see some tensions, but in general there are enough theories to go around. You're tempted to say there are going to be a lot of unhappy theorists, but pretty much every theorist that I've met is a proper scientist. The mark of a scientist is that they're not attached to their ideas. They're attached to the truth. I use that word quite lightly, as well, because philosophically I would find it difficult to say that anything we know about the universe is correct in some sense—a truth would be the wrong word.What it is is the best description we have, and we know that every description we have of nature is not complete. We know that. We know how gravity is not understood. We know that the standard model is incomplete, at least you need something like the Higgs. Even then there are problems that rear their heads, that Higgs doesn't explain everything by a long way. Leon Lederman coined the term "the God particle," although you hear rumors that actually it was his publisher or perhaps his agent to sell some books because "the God particle" implies that it's an answer to everything. You hear that a lot. I get questions at public talks, what are you going to do when you find the Higgs? They always say "when." What are you going to do when you find the Higgs? Is that the end of physics? And it isn't. It causes immense problems actually, the standard model Higgs particle. The Higgs is what's called a scalar particle, the particular properties that it has. There are no fundamental scalar particles in nature at the moment in this particle physics sense. It causes a lot of grief actually. Some people don't like it for that reason, but we'll find out. Where you go next in particle physics honestly depends on what you find at CERN. I'm actually not of the opinion that you just continue to build bigger and bigger machines unless you have specific questions to answer, because I see particle physics as part of the main line of physics. At the moment we need machines of that energy to make progress, so you build one. Then what you do next depends what you find. If you find a Higgs, then that starts a whole research program of trying to measure its properties, because its properties are not entirely specified in any sense by the theory. You probably need something like a Higgs factory. You need a very clean machine. A linear collider would be an example. A straight-line electron collider or it would be electron-electron to just tune to the right everything to make Higgs particles. You make lots of them in a clean environment and you can measure them precisely. The same with super symmetry. If you discover this doubling of the particles of nature with the dark matter candidates there, then you probably need a linear collider to tease it out. But if you describe extra dimensions in the universe, then it may be that a clean machine to make things is not the way to go when you might upgrade the LHC. In a very pure sense you build the accelerator you need when you know what the question is. If you don't have a question, you don't build one, because they're expensive. There is a technical issue with that, which is that the lead time is so long for these machines that you can't really wait until—if you strongly suspect you're going to need another one, you need to be doing the R&D, not only because of the lead time, but the people who build them, the accelerator builders. These machines are incredibly difficult to build and they require experience and they require an engineering community that passes the knowledge from one generation to the next. If you have a 20- or 30-year lead time on these machines you find that the people who know how to do it retire, and if you're not passing that knowledge on then you can't build another one, very simply. You hear that the US has had that problem with rocket technology. It's very difficult to build a Saturn V now if you wanted to because the people who knew how to do it have gone and not passed the knowledge on. I don't know whether that's true, but you hear that. In particle physics this is a problem, and it's the same with any big scientific engineering endeavor. The same problem is there with fusion reactors, which is a very serious problem for the world. We need to have rather more fusion reactors in development than we have at the moment for that reason. I have an unusual background and my path into science was unusual in that I always wanted to be a physicist of some kind. I didn't know what the word was when I was four or five years old. I wanted to be an astronomer. I grew up in a house that watched the moon landings. I watched the moon landing. I was one, but I watched it. My first Christmas eve was Apollo 8 coming around the back of the moon and taking the picture of earth's rise, which was always in the house. So I knew that I wanted to do something that involved that. Science and exploration to me have always been intertwined together. They are really one and the same thing. Throughout my childhood, that was it. I couldn't tell the difference between "Star Wars" and NASA. Whatever it was, it was something to do with space, astronomy, then that was it, to the point where when I was 11 you go to high school in the UK, and I essentially refused to do French because I thought that it wasn't physics, and I actually failed French, the French exam, and then ended up working in Geneva. So there's a lesson—I started at CERN actually about five or six years ago. At the age of 14 or 15, I was going to be a physicist, astronomer, whatever, something. Then I started going to musical gigs, and the one that sticks out in my mind, perhaps somewhat embarrassingly, is that I went to see a Duran Duran gig with my sister in Leeds, which is close to Manchester, where I lived. And I thought, I want to do that—that's great. So I learned to play keyboards—I didn't play an instrument before then—and then at the age of 18, a guy from the band Thin Lizzie moved in down the road from me. Thin Lizzie had just split up, and he said he wanted to form a band. I said, I'll do that; that would be cool. I joined a band with him instead of going to university, got a deal with A&M Records, made two albums, both in L.A., actually, with A&M—one at Joni Mitchell's house, which was really fantastic. Joni Mitchell's husband at the time, Larry Klein, produced it. He's a great bass player. That was in ‘87, ‘88. I did that for five years, had a fight in a bar in Berlin and split the band up on tour, like Spinal Tap, in '92. And that was the end of the band. I came back and the day after applied to Manchester University and said, I want to do physics now—I'll just carry on doing what I was going to do anyway. So I started doing physics. I accidentally joined another band called D:Ream, who then had a number one hit in Britain and a song called "Things Can Only Get Better," which was used by Tony Blair to get elected in '97 and we reformed the band in '97 to do gigs with Blair, which was great fun. As a result, the BBC years ago decided—because I'd been on a show called "Top of the Pops" in Britain several times—that I would be able to present science, because it's the same. That was the beginning of my parallel career of making two BBC programs.